This is the talk page for the article "Ahsoka Tano." "This point forward, we are entering uncharted territory." Ahsoka Tano is within the scope of WookieeProject: The Clone Wars, an effort to develop comprehensive and detailed articles with topics originating in or related to the Star Wars: The Clone Wars television series. Ahsoka Tano is within the scope of WookieeProject: Rebels, an effort to develop comprehensive and detailed articles with topics originating in or related to the Star Wars Rebels TV series. This is ridiculous. I think you guys should recognize that the system you have in place is driving all of us users crazy. It makes no sense to have the majority of the information be in the legends article, ESPECIALLY IF IT IS CANON! The focus here should be on the canon article!! Why would you completely re write the article for canon when the information in the Legends article is perfect? "We don't copy paste" is a silly argument. This is so simple, I'm not sure how you don't see it. Either make both articles nearly identical (get rid of the non canon stuff for the canon article), or have the canon article be the page with all of the information. "Well then the legends page wouldn't make sense" is not a valid argument. As it stands, THE CANON ARTICLE HARDLY MAKES SENSE BECAUSE IT IS MISSING ALL OF THE CANON INFORMATION!!!!!!!!!!! —Unsigned comment by 71.232.59.91 (talk • contribs). Have you guy taken into account that they might be taking her montrals into account when listing her height, and not just the top of her head? There are numerous pronoun infringements in this article. "The Jedi Council finally sent Tano to her first mission on Christophsis to aid the Republic forces and finally meet his new master as well as pass on a message that masters Kenobi and Skywalker were needed on the Temple." "With her master pinned down by the horde, she noticed a piece of wall behind him with a convenient hole just right where Anakin was positioned. She used the force to pull the wall down, crushing the droids around him. Angered that she could've got him killed, she ordered her to blow up the generator." - far too many pronouns here leaves readers wondering who is "she" and "her". Needs to be clarified with names/surnames. "After the fight was over, Skywalker noted how reckless the youngling was and that she would've never made it as Obi Wan's apprentice, but she could've made it as Anakin's. As the two found themselves settled, Yoda wondered if having a padawan would calm Skywalker's wild ways or instead she would pass it onto her apprentice." - Again, meaning is unclear here. 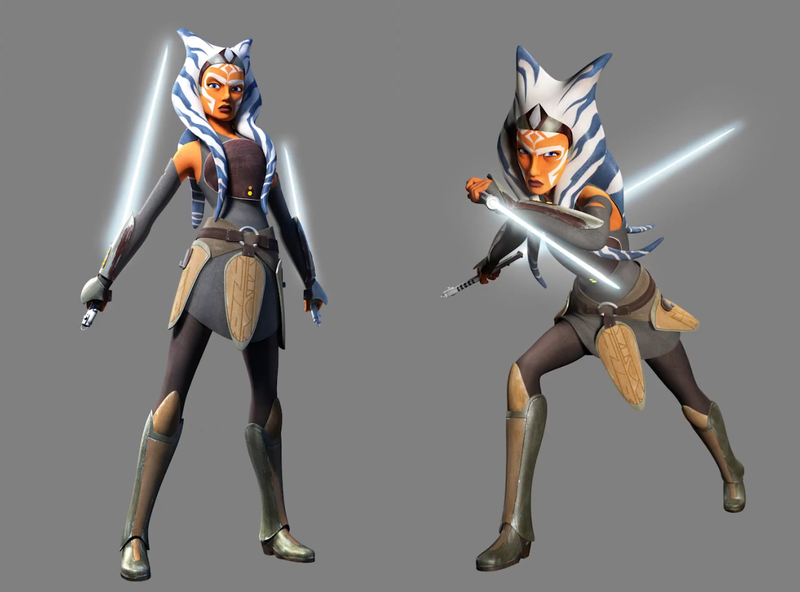 Is Ahsoka going to pass on Anakin's Wild ways to her apprentice, or should it be Anakin passing it onto Ahsoka? There's more, these just jumped out to me, and even more non-pronoun errors. It just occurs to me, at least, that if you can't be bothered to proof-read what you post, you should at least make it editable so these errors can be fixed. The table shows that she died on Mortis; however Filoni has stated that the Mortis arc is a force vision and not real. Therefore she is not dead in my understanding. I have a link to the video here The video can be found on Star Wars The Clone Wars Season Three: Altar Of Mortis Featurette on Youtube (I'm not allowed to link). Ezra concluded that if he could save Ahsoka, she could also save his master. Ahsoka warned him that if he were to do so, Ezra and the others would die. Thinking about this, he allowed the fire caused by the fuel pods to consume Kanan for good. Ezra concluded that if he could save Ahsoka, he could also save his master. Ahsoka warned him that if he were to do so, Ezra and the others would die. Thinking about this, he allowed the fire caused by the fuel pods to consume Kanan for good. In the "World Between Worlds" segment on Ahsoka's page it says "Ezra concluded that if he could save Ahsoka, she could also save his master." In reality it should be "Ezra concluded that if he could save Ahsoka, he could also save his master." If anybody has permission to edit the page, they should fix this. That is unless Ezra is confused about his gender. —Unsigned comment by Hidanprime (talk • contribs).